1. Unique: Can you stand out with the niche you select? Don’t choose a niche that is already overloaded with competition, find one that is original. If you are the only one in your niche, you will be much more attractive to the people in the segment. Choose a niche that is big enough for you to serve, but not one that is so large it attracts a flood of imitators. 2. Reachability: Can you really find the people in the target audience? There is no purpose in choosing a unique target if you can’t really connect with them. You may believe you can make a difference in the lives of a group of people you have identified in demographic research, but make sure you can actually spot them on the ground. 3. Substantial: Is the segment large enough to justify the amount of focus you are putting on it? This is a tough call because there are a lot of important causes and needy people. 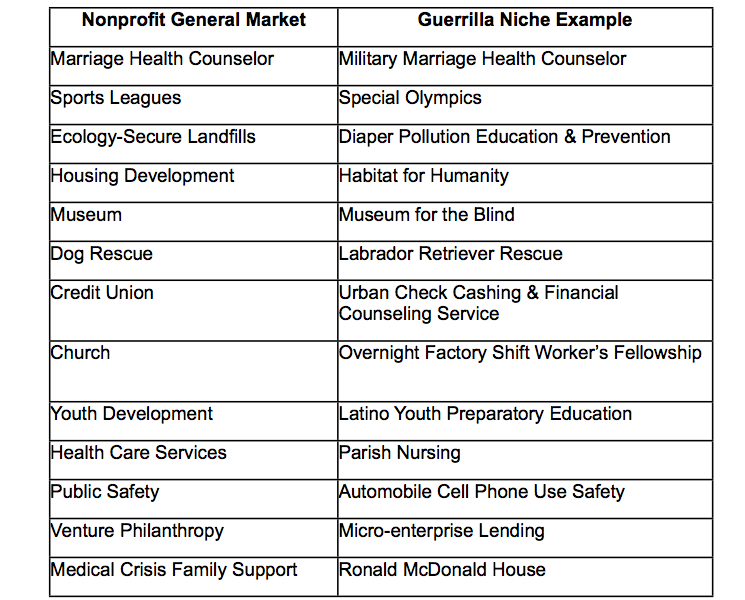 Niche marketing helps assure nonprofits reach under-served communities by encouraging diversification between organizations. But if your target group isn’t very large or significant in some other measurable way, it will be difficult to attract attention and support for your cause. 4. Responsiveness: Do people in the niche want or need what you are offering? Marketing never works well when you are selling what you happen to be making. It only works when you are offering solutions people really need. Discover the needs of people and link your message to the solutions to those needs. 5. Believable: Does what you offer sound plausible to the people in the segment? Can the cause be perceived as a real problem to them? Do you have enough expertise to do what you claim you can do? Is there a track record somewhere that shows you know how you could plausibly solve the problem? Can you articulate the process you will use to attain success? Do people think the product will actually work? 6. Sustainable Impact: Can you really change things? Ultimately, your cause needs to make a difference. Some organizations exist that make long range plans and raise a lot of money initially, only to fizzle out and disappear because they can’t create sustainability. When you can’t demonstrate results, volunteers stop volunteering, funding dries up, and conflict in the organization heats up. Begin with clear, obtainable outcomes in mind. 7. Donor support: Will donors get behind the cause? If what you are doing in your niche is perceived as an eccentric personal project, it will be difficult to find financial partners. To make your ideas work, you will need the generous support of many people. Make sure you have the foundation for financial support to get the job done. Is the problem large enough to attract people who will be loyal to the cause and support it? Even the most important ideas can fail if donors don’t believe in them. Niche marketing is the opposite of mass marketing. Don’t stop with only refining your focus to a narrow audience. Keep your focus on offering a limited range of high-quality programs, products and services. Don’t expand the number of things your organization does, do what you do best. Know who you are and what your niche is and own that space in the marketplace. The chart below shows how niche markets compare to mass markets. Great post, as usual, Chris. All excellent things to evaluate as part of a solid marketing plan. I really like your point about responsiveness. It seems like something so simple, yet it is also something that can be easy to overlook. I think it can be hard to measure responsiveness of your audience. Do you have any great suggestions for gauging need/responsiveness? Betsy, the method of assessment would vary based on your objectives and target audience. Most NPOs could stand a reality check of a little basic research. There are a lot of them that believe if their idea seems good to them, it must be a good idea to the target audience. With one of my projects, Palmetto Technology Hub (www.scpath.org), we’re trying to be different by focusing on local nonprofit needs. There are already great umbrella orgs like TechSoup to address nonprofit technology. Our audience is specifically nonprofits in the lowcountry area of South Carolina. Excellent article/blog on Guerrilla Marketing and the Seven Keys to Finding Your Niche. I am writing you for your opinion and help on direction, as I have come to the conclusion I am going to need some help beyond the normal, traditional sources to form and succeed with a non profit. Upon reading your information and being as honest as I know with my answers, I am convinced now more than ever I have a model that matches and sometimes goes beyond your seven points and still maintains itself within a niche. Furthermore, I have mixed emotions about moving forward and sharing my model, as I would be in heaven to see my model become an overnight phenomenon in all the projected metropolitan areas where it should succeed; yet I am reluctant to throw all my cards on the table fearing my idea would be scooped up, promoted and made famous without my efforts amd entry into the market. Please respond and hopefully with more than just a five word sentence.